When Game Of Thrones returns this Sunday, we’ll be ever closer to finding out who will take the Iron Throne once and for all. But the final season of HBO’s juggernaut fantasy series will also have to answer dozens, if not hundreds, of questions that have been posed in the seven years since it premiered. In addition to very pressing matters, like the outcome of the impending war between the living and the dead, David Benioff and D.B. Weiss will have to reckon with what remains of Arya’s murder list, the true identity of Valonqar, and just when Cleganebowl is going down already. Benioff and Weiss clearly have their work cut out for them, but their fantasy adaptation is hardly the first series to have so much to answer for in its final moments. 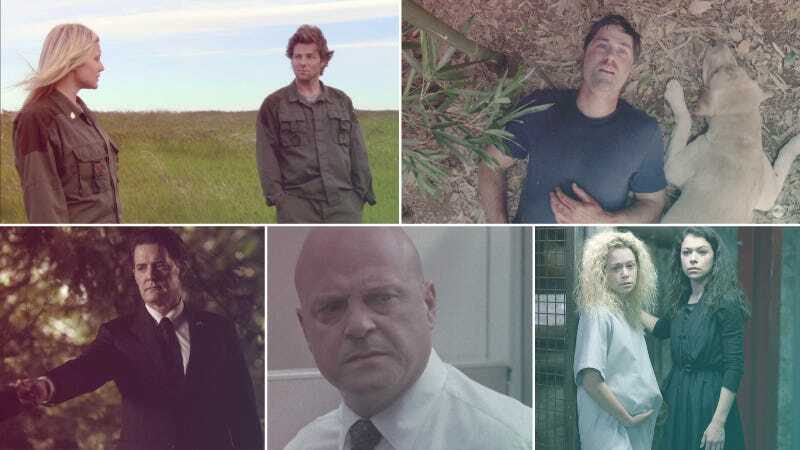 From The Shield to Lost to Twin Peaks (the revival), shows that craft such intricate stories—their own mythologies, really—have faced the question of how to make it all pay off (or not). So before we head once more into the Red Keep, The A.V. Club is revisiting five series finales that also had a lot of heavy lifting to do. Battlestar Galactica was always at its strongest when it focused on the very human elements of its small band of survivors and the Cylons hunting them. The show lost its way when seemingly divine influences intervened and grand mysteries were introduced in later seasons. Like the teased master plan for Battlestar Galactica’s scrabbling humans, the writers room appeared to be saving some big reveal—or at least an explanation—for the series’ end. Unfortunately, the finale didn’t deliver. Yes, the scrappy cohort leading humanity’s survivors (plus some friendly Cylons) found Earth—er, a second Earth—and the final scene reveals that all of this really has happened before: The events took place in the distant past, not the future. But once the cast lands on Earth, Starbuck fulfilling her quasi-messiah role to lead them there, she simply vanishes. The hallucinations versions of Number Six and Gaius Baltar are angels... perhaps, or maybe just eternal beings wandering and watching and delivering arch bon mots wherever conscious life gathers. And much of the actual decision making—the nitty-gritty questions of democracy and survival that fueled the show—is brushed aside along with the tangle of allegiances and complications in order to tie humanity’s fate into a neat bow. More than a decade out from its bow, The Shield’s finale remains one of the best to have ever aired, with the shocking murder at the center of its infamous pilot episode having swooped back to haunt both Det. Vic Mackey (Michael Chiklis) and the police department that spent seven seasons trying to expose his corruption. In the end, though, Vic won, having inked an immunity deal with ICE that protects him from prosecution. The rub? He has to confess to every one of his crimes in order to get the sweetheart deal they promised, which includes a cozy job with ICE. When he takes the deal in the penultimate episode, rattling off the myriad murders and cover-ups he’s orchestrated over the years, he triggers a chain of events that affects just about every other major character on the show. That leaves the finale with a season’s worth of plotlines to resolve. There’s the Mexican cartel boss Vic is being forced to set up, not to mention the terror that Vic’s deal is set to unleash on his last ally, Ronnie Gardocki, who he screwed out of an immunity deal, and Shane Vendrell, the fugitive ex-cop who’s spent the entire season threatening to expose Vic. There’s also the fate of Vic’s family, who’ve gone into witness protection, and that of police captain Claudette Wyms, who, in her ailing health, wants nothing more than to see Vic pay. Meanwhile, hapless detective Dutch is trying to pin down a serial killer, mayoral hopeful David Aceveda is seeding a bit of corruption of his own, and Billings was doing whatever the hell Billings was doing (something with vending machines?). Finally, though, where will we leave Vic Mackey, who’s secured his freedom at the cost of everything he loved? Across its first four seasons, Orphan Black developed into a thrilling (and occasionally unwieldy) web of multiplying clones and competing campaigns against their autonomy, so by the sci-fi drama’s fifth season, its writers more than had their work cut out for them in bringing everything to a satisfying close. Fortunately, creators Graeme Manson and John Fawcett had an ending in mind at the series’ inception, and the final episodes moved toward it with energy and purpose, even if they left a few strands hanging along the way. It was all done in service of “To Right The Wrongs Of Many,” where, quickly picking off its last two conflicts at the beginning of the episode, the show devoted the bulk of its final entry to giving its loyal audience (a.k.a. the #CloneClub) quality time with its beloved core characters before saying goodbye. Tatiana Maslany’s name-making run as Leda clones Helena, Sarah, Cosima, Alison, and Rachel (among others) had, after all, become the show’s primary draw, and “To Right The Wrongs Of Many” rightly ends with a focus on the chemistry and sense of sisterhood she built between them. The show that launched a thousand imitators, ABC’s Lost doesn’t often get the credit it deserves for helping to shape and influence the current television landscape. And the finale, frankly, is a not-insignificant part of the reason. It’s rare to see a hugely popular show turn in such a profoundly divisive conclusion—and by “divisive,” we mean, “a lot of people hated it so much it made them retroactively angry at the entire series.” Even after shedding viewers with its increasingly dense and mythology-heavy later seasons, the supernatural drama was a ratings juggernaut, with more than 11 million people regularly tuning in for the final showdown between good and evil—and boy, did those people make their displeased voices heard once the final credits rolled. The show had kicked off with a simple and intriguing premise: A bunch of people survive a plane crash on a remote island, only to quickly realize they have no idea where they are, and no help seems to be forthcoming. Oh, and also there might be some strange monster in the jungle? The Twilight Zone-esque twist to the Robinson Crusoe template hooked viewers, and as the show progressed, it dropped more and more tantalizing mysteries and elusive riddles. The remnants of a decades-earlier experiment! Kids with special abilities! Strange radio signals! Cursed numbers! Hatches! Temples! On and on the puzzles accrued, one after the other, with answers coming rarely, and often only to further goose the narrative, rather than resolve any lingering complications. By the final season, our castaways were split between two realities following the detonation of a nuclear weapon on the island: In one, they continue on with their island-bound struggles, trying to prevent a mysterious Man In Black from killing them and escaping the island. In the other, the crash of Oceanic flight 815 never happened, and we watch as they play out their various lives in an alternate timeline. It soon became clear that, short of a four-hour finale consisting solely of a schoolhouse lecture explaining every little symbol and confounding clue, the final episode would never be able to explain away every single strange talisman or plot wrinkle the show had introduced through the years. Instead, it would just paint in broad strokes, completing the tale creators Damon Lindelof and Carlton Cuse had eventually landed on over the course of its early going.